If you’re trying to deal with too many debts, you’re probably wondering whether Chapter 7 or Chapter 13 bankruptcy will help you out. Once you’ve decided that Chapter 13 might be the best option for your financial situation, your next questions are likely to be how much it will cost and whether it will work for you. In order to get some real-life answers to these questions, we surveyed readers across the country about their recent experiences with bankruptcy. Here’s what we learned from those who filed for Chapter 13. 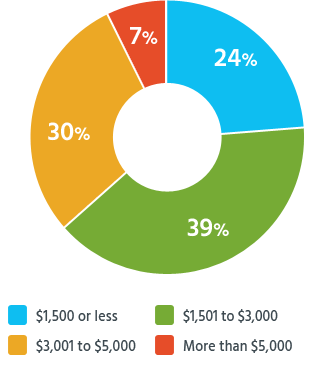 On average, readers paid their lawyers $3,000 for Chapter 13 bankruptcy. How Much Do Chapter 13 Attorneys Charge? Bankruptcy law is complex and confusing. Chapter 13 cases can be especially knotty, and mistakes may lead to serious financial problems down the road. So we weren’t surprised to learn that almost all of our readers (97%) hired a lawyer to help them through the Chapter 13 process. The cost for their attorneys typically ranged from $2,500 to $5,000. But most readers (63%) paid $3,000 or less. Still, the $3,000 average cost was twice the average that other readers paid their lawyers to handle Chapter 7 bankruptcy cases. Attorneys charge more for Chapter 13 cases because they take longer and involve more work. But Chapter 13 offers an advantage in how attorneys’ fees usually work: While the vast majority of bankruptcy lawyers charge a flat fee that covers their basic services, most of the time, they’ll only ask for an initial down payment before filing the Chapter 13 bankruptcy petition. (At that point, you’ll also have to pay the filing fee: $310 as of December 2017.) Then the rest of the attorney’s fee is included in your monthly payments under the Chapter 13 plan, which means that it comes out of the amount that would otherwise go to your creditors. you’re involved in a lawsuit when you file for bankruptcy. How Many Readers Completed Their Chapter 13 Plans? 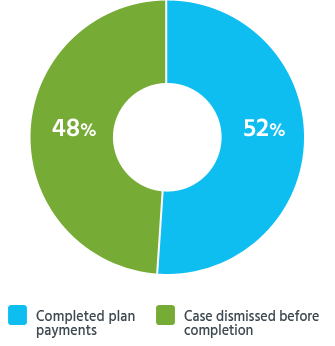 Our survey showed that readers had slightly more than a 50-50 chance of success with Chapter 13 bankruptcy: Only 52% of readers successfully completed their Chapter 13 plan, while 48% had their cases dismissed. How Long Does Chapter 13 Bankruptcy Take? Chapter 13 plans extend over three to five years. The length of your plan will depend on your income and how much time you need to make the payments. (For more details, see our article on how long Chapter 13 plans last.) Before you start making payments, however, the court has to approve (or “confirm”) your plan. For half of our readers, this process took three months or less. It took more than six months for only one in ten readers. 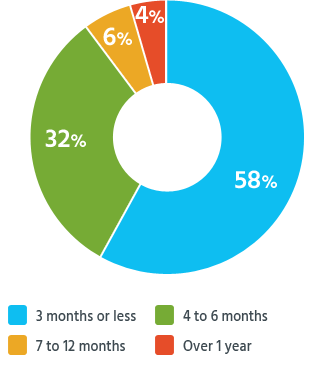 Even though it takes years to finish paying off a Chapter 13 plan, nearly nine in ten readers (88%) told us that as soon as they started the process, they got immediate relief from one troublesome feature of financial troubles: phone calls from debt collectors. That’s because once you file the petition, the court will issue what’s known as an “automatic stay,” which orders creditors to stop trying to collect their money. Were Readers Satisfied With Their Chapter 13 Experience? 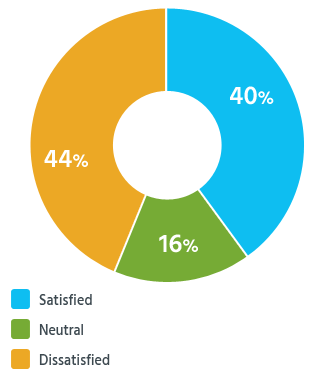 Readers who filed for Chapter 13 bankruptcy were about equally split between those who were satisfied with the outcome (40%) and those who were dissatisfied (44%). Given the number of people who weren’t able to complete their repayment plans successfully, it’s understandable that many of them would find the process frustrating. Overall, the survey results demonstrate how important it is to get good advice from an experienced bankruptcy attorney before you file, so that you can make smart strategic decisions and come up with a realistic plan if you choose to go down the Chapter 13 path. Unless you're 100% sure you can consistently adhere to the parameters of a Chapter 13 plan, opt for Chapter 7 and let it all go. Otherwise, you're inviting more heartache.